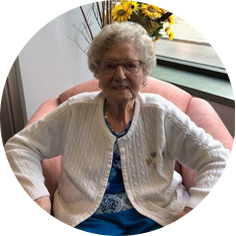 Dorothy Ena Parsons, aged 91 years of Moose Jaw, SK passed away peacefully, with family by her side, on Tuesday, April 2nd, 2019. Dorothy was born in England. While living in England, she married Tom Parsons and they moved to Moose Jaw in 1960, where they raised two children. Dorothy was an avid golf fan and Tiger Woods was her favourite golfer. She also enjoyed watching Tennis and Hockey. She was very involved with the Moose Jaw Lions Band and Lions Club. Dorothy was a very friendly lady who was kind to everyone, and always had a smile on her face. She was predeceased by her husband, Tom in 1988. Dorothy will be lovingly remembered by her sons, John (Patsy) and Jim (Arlene); daughter, Shelley (Gord); 7 grandchildren and 6 great-grandchildren; sister, Margaret Houghton; her siblings in England: Rene, Mary, Molly, Bill, Joe, and Sue; as well as numerous other relatives in England. In keeping with Dorothy’s wishes, a Private Family Service will be held and her cremains will be taken back to England. Flowers are gratefully declined. As an expression of sympathy, donations in Dorothy’s name may be made to the Salvation Army, 175 – 1st Ave NE, Moose Jaw, SK S6H 0Y9. The family would like to thank Rachel Connolly for all the loving care that she provided to Dorothy for the last few years. Arrangements are entrusted to Moose Jaw Funeral Home, 268 Mulberry Lane. Todd Sjoberg, Funeral Director 306-693-4550. It’s sad to hear Mrs. Dorothy Parsons has died, our sympathy goes to all in the family. Some of us may ask why do nice people grow old and die? We personally asked that same question about our own parents, and we found the answer and comfort from words written in Bible at 1 Corinthians 15: 22 – 26. We hope you would receive the same comfort.